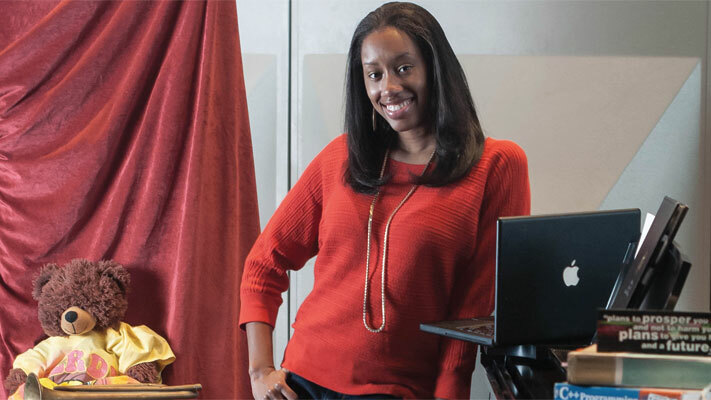 It’s no surprise that Marquia Lewis decided to study computer science in college. “I was around computers all the time growing up, and I really like them,” says Lewis, a junior whose mother, a software engineer for The Boeing Co. in St. Louis, also majored in computer science. But Lewis just as easily could have majored in dance. She was on the dance and step teams at Hazelwood Central High School in St. Louis, and she was active in her church’s dance and music ministry while growing up. Fortunately, she has an outlet for dance at S&T. You’ll often find her performing with the Gold Miners dance squad at a football or basketball game or expressing her spirituality through dance at a Voices of Inspiration Gospel Ministries event. Jessica Harvey, a high school friend-turned-S&T classmate, introduced Lewis to Voices of Inspiration during her freshman year. It was a great fit because it combined her passion for dance with her faith. A year later, she became president of the 20-member organization. While involvement in the Gold Miners and Voices takes up much of her spare time, Lewis also serves on Missouri S&T’s Diversity Leadership Council and Student Diversity Mentoring Program. Last summer, she mentored incoming freshmen as part of S&T’s Opening Week program. She also finds time to game. She especially likes the Halo series of multi-player online games. “Most guys are surprised when they find out I have my own Xbox 360,” she says. Although she loves computers, coding doesn’t come easily to her. She took no computing classes in high school, so at times she feels like she’s behind the curve of other S&T computer science students. But she’s found that her fellow comp sci majors are willing to help or offer advice. In that regard, coding is a lot like dance. Practice makes perfect. This story was originally published in Missouri S&T Magazine.